The Beartree is comprised of five different sections and each one has its own unique atmosphere. You can almost think of it as a 5-headed bear...but if the bear was nice and welcoming...and served you pizza and refreshments. Eh, maybe that comparison doesn’t work. At the front of the building is the historic cafe. Built in 1952, the cafe still feels like a classic diner. The layout hasn’t changed much over the years and the stools at the counter haven’t either. In the ‘50s, the cafe had a sign that said, “We can feed 1000 people, 20 at a time.” Today that sign would say, “We can feed 1000 people, 30 at a time.” A minor improvement but it’s something. In the back, you’ll find the tavern. It’s anchored by a sizable bar which is surrounded by a sprawling dining area, with booths and tables tucked away in pockets and along barnwood walls. This area seats upwards of 60 people and offers lots of fun including live music, a dance floor, a pool table, a jukebox, a dartboard, several large TVs, and a decent amount of men wearing ponchos. Off to the side of the bar is a banquet area we call the “Cub Room.” It’s private and holds approximately 30 people. It’s perfect for birthday parties, rehearsal dinners, and business luncheons. The Cub Room is lined with big windows that look out onto the backyard, so it’s also perfect for spying on people, especially if a band is playing in the cabana. The backyard might be the closest thing Centennial has to a park. (Although, you could make an argument for the patch of sagebrush in front of the post office.) 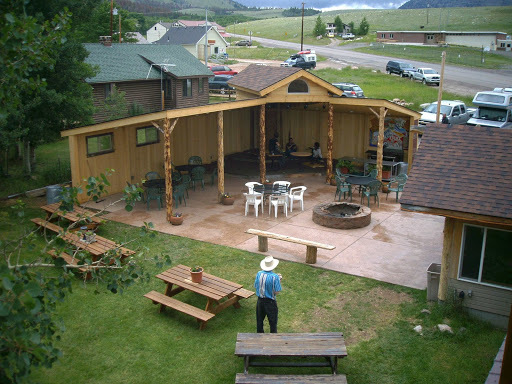 The backyard has a big, well kept lawn dotted with several picnic tables, aspen trees and benches. It’s also home to “The Cabana,” a wooden bandshell where you can see live music throughout the summer. The backyard is a great place to soak up the precious 2 and ½ months of nice weather Centennial is generous enough to offer us. And in case you forget you’re right next to a beautiful national forest, you can walk up to our roof deck, have a pizza and a beer, and get a 360º view of the area, where you can see everything: Table Top Mountain, Medicine Bow Peak, Hogback Hill, probably a few stray dogs, and maybe even a local milling about in their home. But no matter which section (bear head) you choose to hang out in, we’ll work hard to make sure you have great food and a great time.